The first Source Book for The Fabled Lands Role Playing Game. 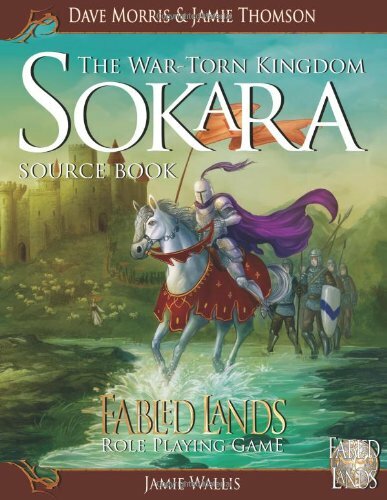 Sokara is a country torn apart by civil war. Grieve Marlock, the newly self-appointed Protector General of all Sokara, has overthrown and killed King Corin Vii; now the country is divided between those faithful to the revolution, and those still loyal to the heir to the throne - Vergan Corin. No stone is left unturned as we take you on a journey through the War-Torn kingdom. Visit the beautiful cities of Marlock and Yellowport, climb the Coldbleak Mountains or walk to the northern mountain range known as the Spine of Harkun. Knights, monsters, royalty and a smouldering city are just a few pieces of source material ready to be included in your Fabled Lands Role Playing Games. Look out for the other Fabled Lands Source Books from Greywood Publishing. This is not a stand-alone product and requires the use of the Fabled Lands Core Rule Book to play.